That photo is so cute!! Thank you – he was quite happy to model it for me in the absence of its intended recipient. I have one of those to make but in DK. I should have used chunky yarn! Looks very pretty! DK will be lovely, although I’m glad I’m using chunky as I’vs got another one to make before Christmas! 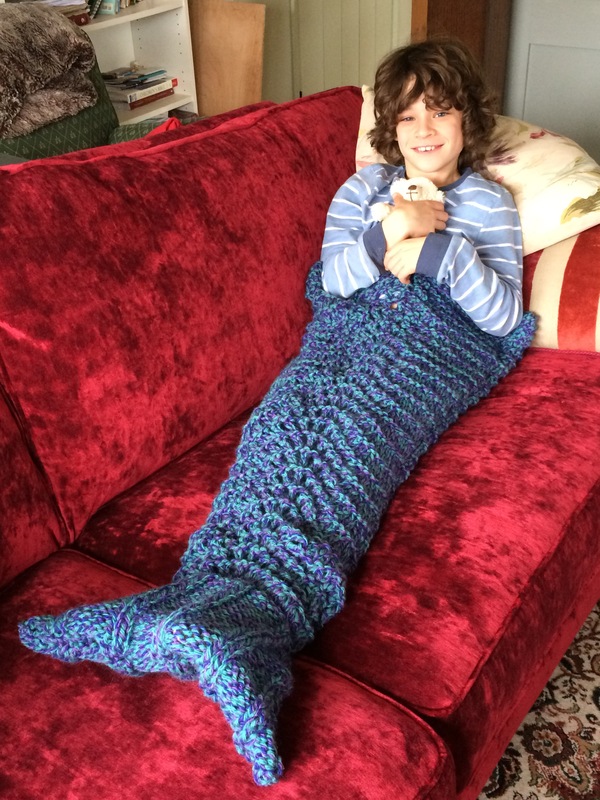 I bought one of these for my daughter’s birthday in April, it’s lovely but now I have to say yours looks thicker and also she can’t get her feet into the tail (it’s just a floppy feature) – I love that part of yours! It was handmade 🙂 but I think there are cheap China ones now and I’ve heard New Look do them which is kind of a shame, I know a lot of crafters sell them! Well, my Mum knits but not that fast. As Beth says, New Look have them now and the Chinese sellers (which is probably where the New Look ones come from) and I haven’t seen them yet as they are in Christmas wrapping but I’m imagining they won’t be anything like as good as the sort of one you have made. What a charming photo…and mermaid tail. The receiver will be thrilled. Already planning on making one of these, if I cna get the yarn in super chunky, it will definitely be jumping to the top of the to-do pile after Christmas! It’s a pleasant knit, too, if you know what I mean. The pattern is only a four row repeat, so you don’t have to concentrate too hard. I suspect my (33 yr old) daughter would love this! Such a sweet picture. I love the mermaid tail. They have a shark for boys too. the legs go in the body and tail like the mermaid. Instead of the waist at the top you have the sharks mouth open teeth and all for the boys to have at their waist. It looks like the little one is being eaten! LOL Awesome!